On this day students are encouraged to study but before that they need to pile up their books in front of the idol of Goddess Saraswati in order to seek her blessings. It is only through knowledge that an individual can conquer the world, which is why much emphasizes has been given to knowledge and wisdom in the life of a student. With her unwavering stance that showcases peace, knowledge and love for her devotees Mata Saraswati is a gentle avatar of Maa Durga. 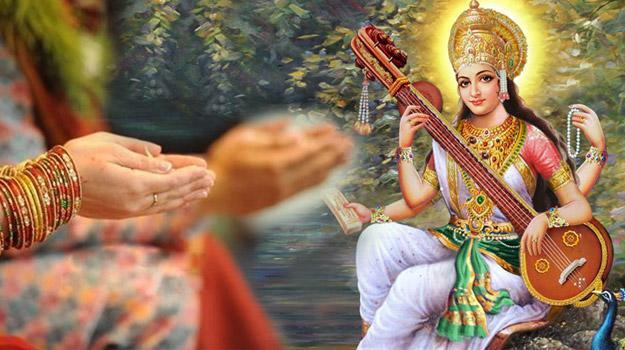 Goddess Saraswati is seen on the peaceful lake of the mind, bestowing the peace of silent meditation, which is necessary in today's fast paced life. Meditation and remaining calm is an important aspect in every student's life which helps him/her attain purity and wisdom.